French food and cooking are generally considered the backbone or the underpinning of many cuisines across the Western world. The influence and recognition of classical French cooking techniques are legendary. This status is precisely why French cuisine can be intimidating for a beginner to learn. French food leaves many cooks feeling that they have something to live up to a certain unattainable elegance and flair. In the U.S. that may come mainly from the influence of Julia Child, the well-known writer (and later television personality) who brought French cooking to the American public. Mastering the Art of French Cooking (the title of Ms​. Child's famous book) is considered by many to be the pinnacle of her culinary achievement. What food is prepared by the French depends on where they live. They will usually cook and prepare dishes local to their region. This is no way means they are parochial; the French have a real sense of terroir which is why rural French cooking is alive and kicking in France. In Metropolitan France, they are likely to sample a wide array of regional and national dishes. This is true in many cities around the world where the residents are multi-cultural or different ethnicities. Typical French foods rely heavily on local products. Fresh apples, berries, haricot verts, leeks, mushrooms, various squash, and stone fruits are among the most commonly used products. Poultry, beef, lamb, and veal are readily available year-round; game meat is especially popular and abundant during the hunting season that runs from early autumn to February. No matter the location, France has an abundance of artisan cheese and wine. Southern France features the rich, sophisticated flavors of mushrooms and duck as well as the dramatic herbs, tomatoes, and olives borrowed from neighboring Mediterranean cuisines. Northern France also showcases a remarkable assortment of tastes, focusing heavily on farmhouse-style specialties using apples, dairy, pork, potatoes, sausage, and beer. France hasn’t always been keen on garlic, mushrooms, and truffles. Before the 15th century, seasonings and decorations were used to disguise food that had spoiled. France had what many today consider peasant food; it was simple fare without extravagant adornment. In the mid-15th century, Catherine de Medici of Italy moved to France to marry the future King Henri II, bringing with her Florentine-educated cooks and a sense of creative drama and manners. In the coming years, French cuisine turned into a magical art of beautiful presentation and innovative flavors. The 20th century brought about dramatic changes in French cuisine as well. Traditional haute cuisine (grande cuisine) is the world-renowned food made famous for its elaborate preparation and a precise presentation. It was the model of French food preparation until food critics challenged it for being too inflexible. New cuisine (nouvelle cuisine) was a 1970s backlash to the classic heavy French cuisine. It lightened up cream sauces and focused on the true tastes using fewer ingredients. It is evident in today’s general French cooking through flexible preparation methods and more experimentation with non-traditional flavors. Vichyssoise, a pureed potato soup, was invented in New York City by a French chef. 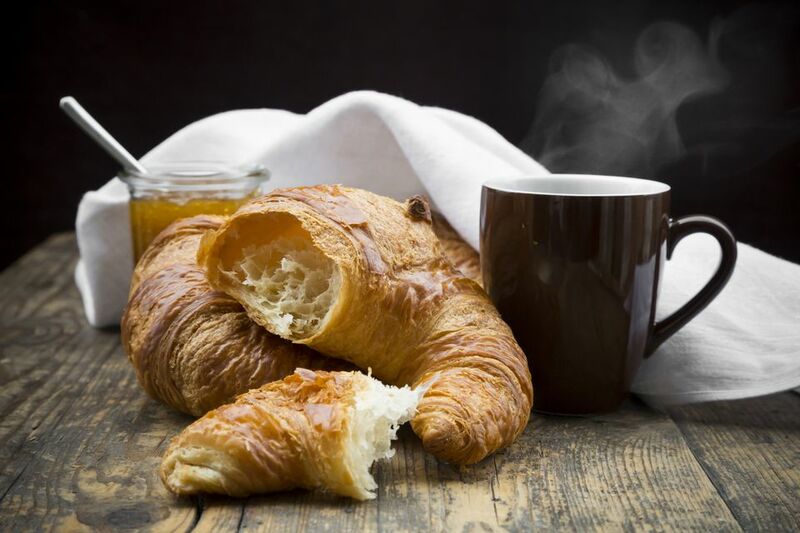 The croissant, a delicate, flaky French pastry, was invented in Vienna, Austria. Brazil’s coffee industry originated with an adulterous affair between French Guiana’s First Lady and Lieutenant Colonel Francisco de Melo Palheta. He came to settle a local border dispute and he left with smuggled coffee seeds she hid in a goodbye gift. French cuisine is a unique, cultural experience that melds flavorful, nutritious foods with beauty, leisure, and therapeutic preparation. Making and savoring French food is an art that takes a lifetime to master, yet requires that time stands still to appreciate its splendor. Explore French cuisine and consider it an art, a tradition, and a way of life.